I've always loved crafts and DIY projects. There is something so rewarding about creating something beautiful and inspiring. I also love giving gifts that are unique, and come from the heart. This often means that I make gifts for family and friends, like you've seen here and here. 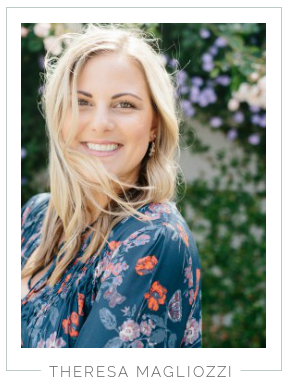 My DIY Pinterest board was the very first one I created, and this was one of my very first pins. 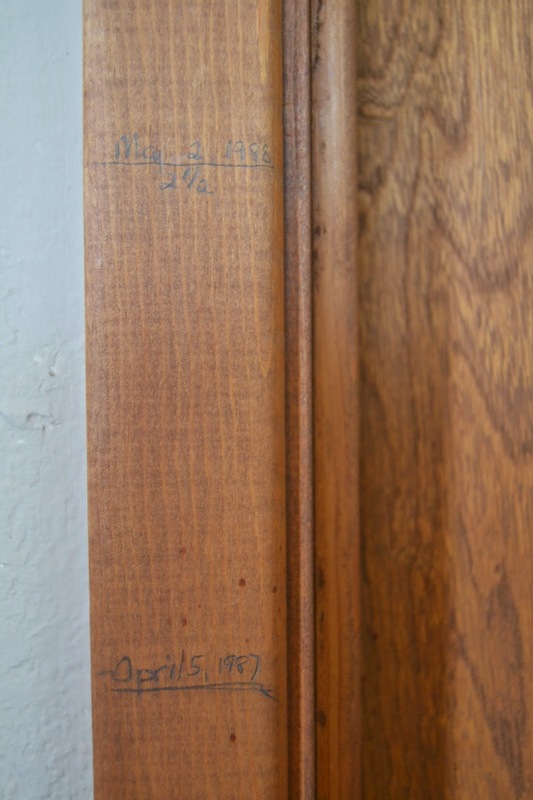 Growing up, our parents measured us on the molding of our bedroom closet. My sister and I each had our own side, and I can remember lining up against the wall so our parents could see how much we had grown. 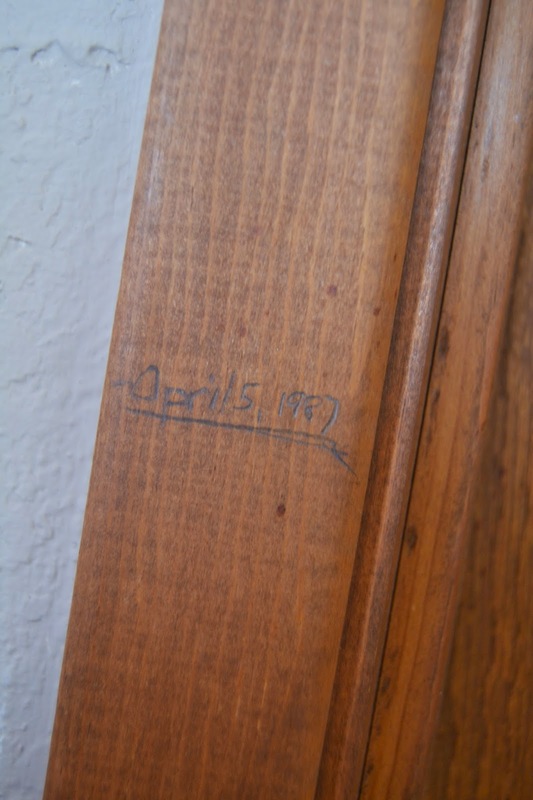 Over time, the writing has faded, but I still love how that growth chart captures a bit of our childhood. The only trouble is, when my sister and I were both out of the house, my parents wanted to re-do that bedroom for a proper guest room. I somehow convinced them to leave that one portion of trim unpainted, preserving our growth history. 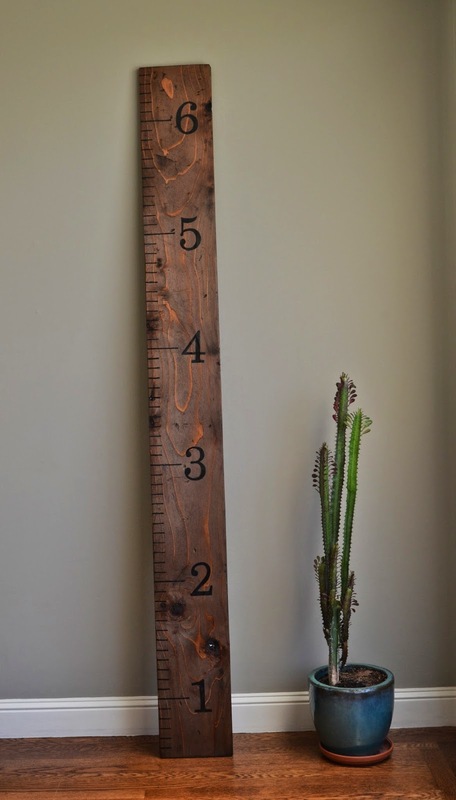 The beauty of this DIY growth chart is that you can move it from room to room, or house to house. I am lucky in that my parents still live in the same house I grew up in. But I know that's not the norm. Most people move at least once throughout their childhood, and this is something they can bring with them. For Phillip's first birthday, I knew this was something I wanted to make for his gift. At a year old, there is nothing you really need. Heck, pots and pats are as good a toy as any! But I thought this would be something he and his future siblings would enjoy years later, and I knew it was something his Momma (my sister) would love! I went to Home Depot to buy the supplies I didn't already have on hand. Specifically, I needed the board. 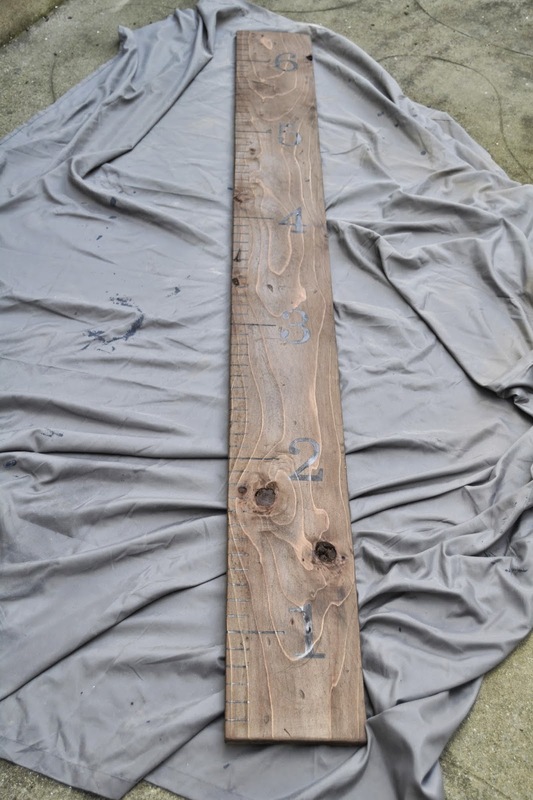 I had planned to buy a pine board and have it cut to 6 feet. However, I lucked out and found a board in the discount bin that was roughly 6 feet. It was pretty beat up, but I actually like that about it, I knew once I sanded it down it would work perfectly for this project. And at 75% off, it came in at less than $3 for the board. Score! Once I was home with my supplies, it was time to start sanding. We have a small power sander, which made this process much quicker, but you can sand down your board by hand as well. Because mine was so beat up, I used a rough grit sandpaper, 55 I think. I went over the entire board (front, back & sides) thoroughly then wiped down the board to remove all the sawdust. I wanted a smooth surface, so I went over the entire thing again with a fine grit paper, 220. This gave me a silky smooth finish. Once I was done I used a damp cloth to make sure the board was completely clean and let it dry over night. Next, I wanted to roughen up the board a bit. I found this big screw we use camping to stake Louis leash down, and just beat my board with it a little bit. I love the little ridges it created. I didn't go too crazy, but just wanted to add a bit of character. The next step is to condition the wood. 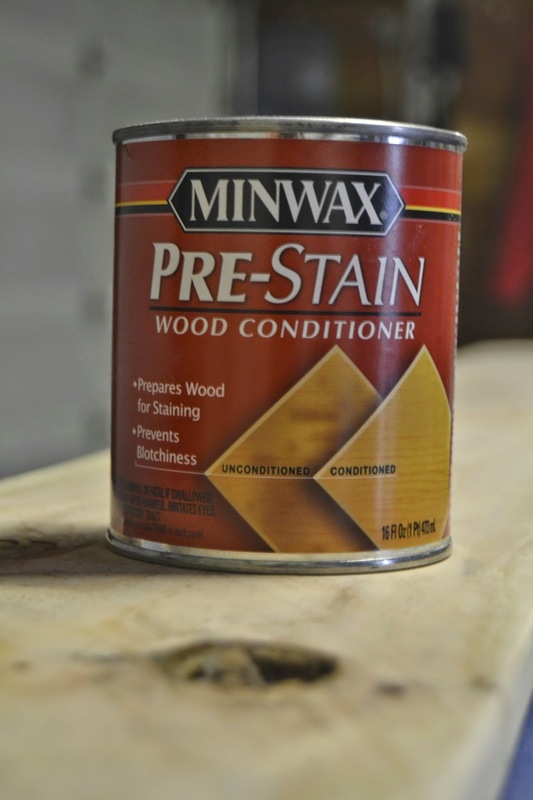 I had read on Young House Love that using a wood conditioner prior to staining helps give the wood a richer more even color. Since I was using the same stain as they had and I consider them experts, I followed their lead. I let the first coat of stain dry over night, then went back to add a second coat, but only on the front side of the board. I figured that was all that mattered anyways. At first I was concerned the stain was too dark and that the black painted lines and numbers wouldn't show up. But after about 2 days drying in the garage, it was the perfect rustic color. Now it's time to measure the lines to create our ruler. 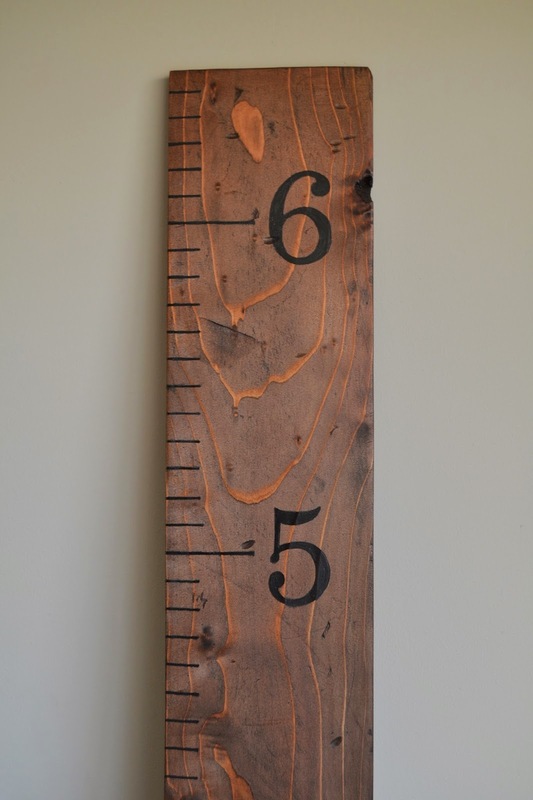 You want to start measuring at 6" to allow for space to hang the board on the wall. 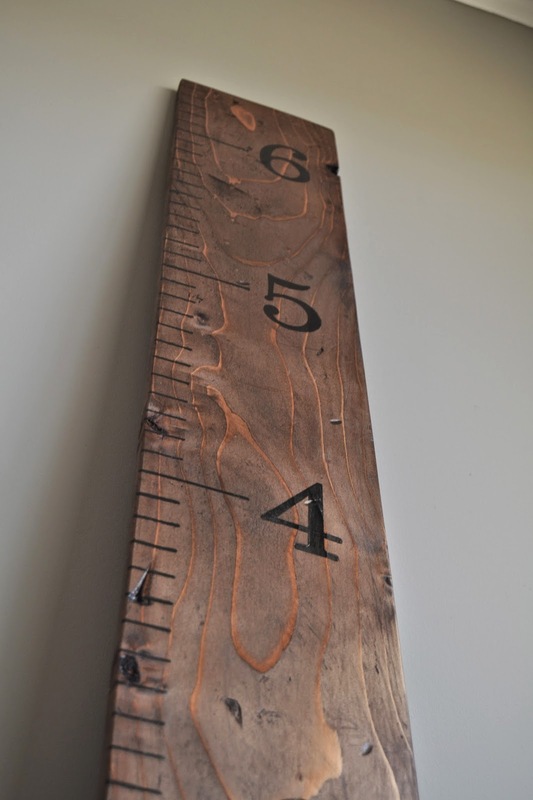 This means, your 1" foot mark, will only be 6 inches from the bottom of the board. Make sense? This is probably the most important step. It would be a shame to do all the work and have the measurements off. I decided to use a tape measure to mark my board for the lines I would paint. I only made a mark every inch, I think it would look to busy adding more than that, but it's up to you. Andrew held the measuring tape in place for me while I used a pencil to mark where I would draw lines for every inch/foot along the board. Next, I went back with my straight edge and still using a pencil, drew my lines. For each of the 1" marks I made my lines 1.5" and for the marks at each foot, I made them a little longer at 3.5"
To make the black marks and numbers, I found a black paint pen at the craft store. I've also seen tutorials that use address numbers from the hardware store, or vinyl numbers they ordered from Etsy. It's personal preference, but I'll show you the method I used. Once you've done all your 1 foot marks, it's time to go back and mark every inch along the ruler using your measuring tape as a guide. Remember, start measuring at 6". I lost the tape for the 1" marks, much easier! For the numbers, I used the same method I used making the stool for Phillip at Christmas. First, I printed numbers in Word in Century font at 400pt. I then changed it to outline only, so it was just the outline of each number, 1-6. Once my numbers where printed I cut the paper down so it was just a small square around the number. I used a pencil to scribble on the back of the page, make sure you get full coverage on the entire back of each number. Next, flip your paper over where you'd like it placed on the ruler. 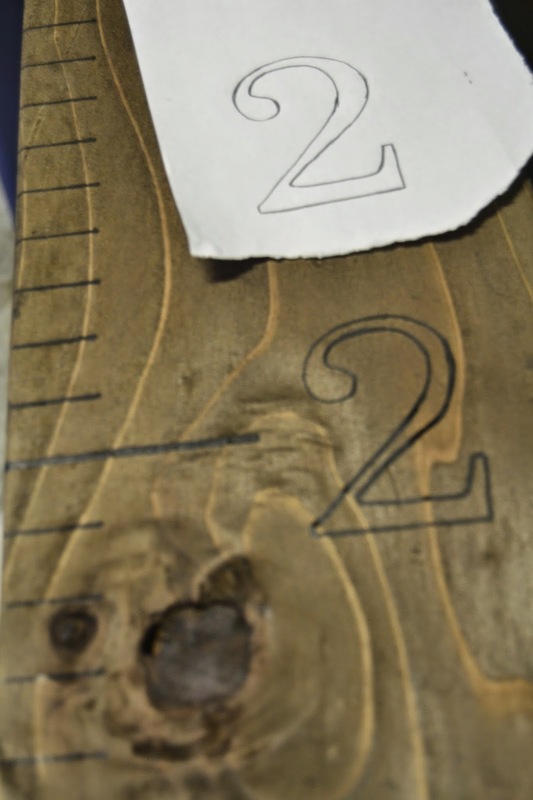 Then simply trace the outline with pencil, this will transfer the pencil you scribbled on the back, making an outline of each number on the wood. Since my stain was dark, it was a bit hard to see. But the outline dark enough to trace with my paint pen. Once I colored in each number, I went back to do another coat. 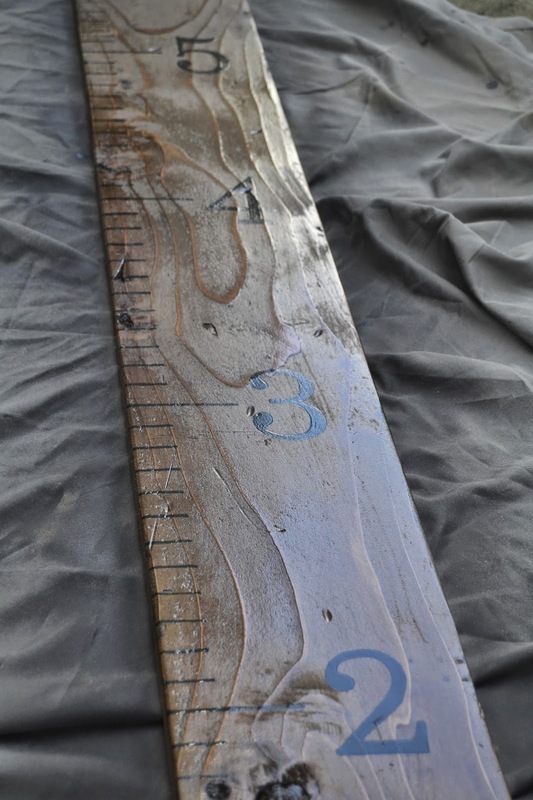 I also did a third coat on each mark along the side of the ruler and let it dry overnight. It's very light because of the dark stain, but I was able to trace over it. I started with an outline first, then filled it in. 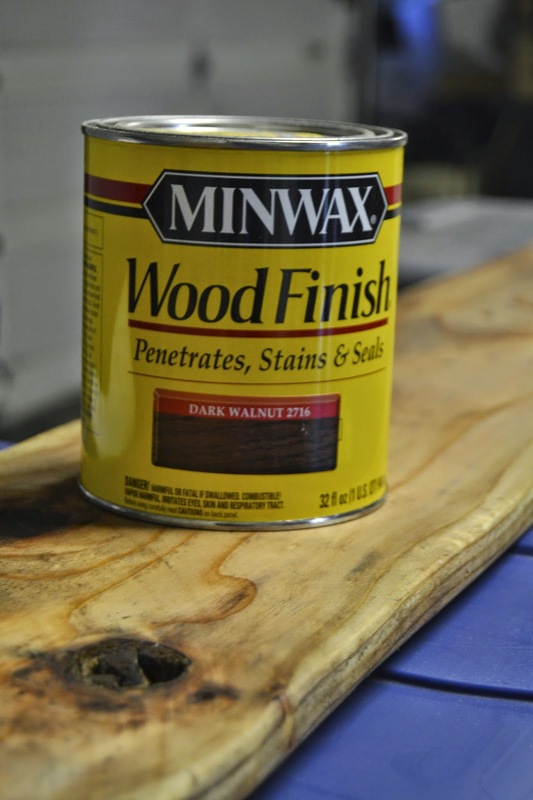 The final step is to use a clear coating to protect your project. I had seen this spray version on another blog, and decided to follow her recommendation. I did two coats on the front and sides of my growth ruler. I liked that it wasn't too glossy, and just gave a protective finish. All finished! I was so happy with how this came out! It was exactly as I had pictured in my head, and I knew my sister would really like it. I couldn't wait to take it home for Phillip's birthday party! Since this was a gift, I didn't hang it on the wall to get the "after" photos, but you can still see how great it turned out. Plus, it shows why you need to start the measurements at 6" to allow for the baseboards and any molding on the wall. 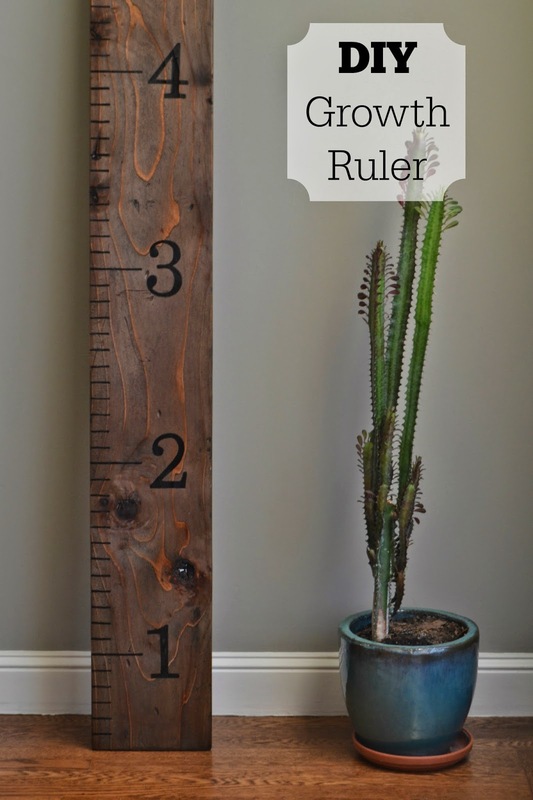 To hang the growth ruler, there are a few options. I had seen examples of these hung with a picture hook on the back or screwed directly into the wall to ensure your little one doesn't pull it down. Once I told my sister about these two methods, she decided to do the later and just use black screws, and drill through the numbers so it wasn't noticeable. If you decided to use a picture hook, you could reinforce the bottom with heavy duty Velcro. My sister hasn't had a chance to hang this yet, but here is a cute picture she snapped of Phillip with it. Now that he's walking it's hard to get him to hold still! 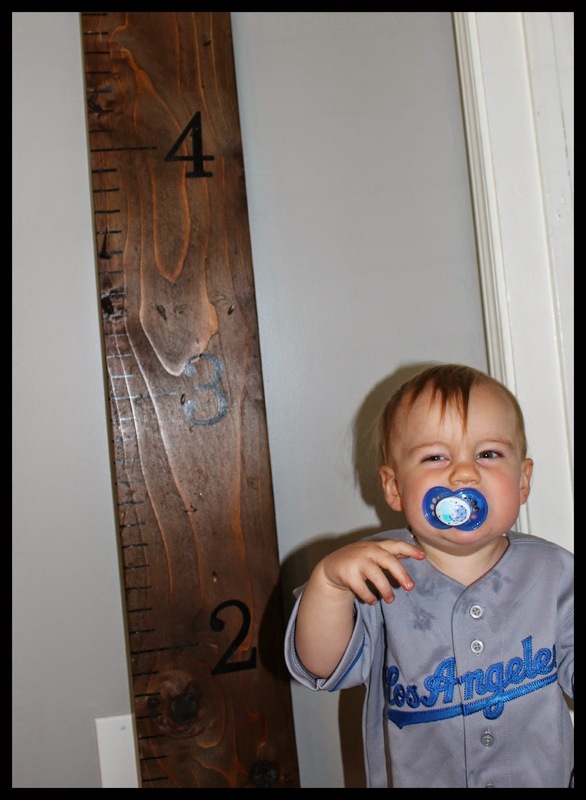 I can't wait until they get it hung and mark his height at 1 year old! If you have any questions let me know! It was really a simple project, anyone can do it! This is SOOOO cute!! What a great idea! I love this so much. Hopefully I can convince my husband to make this for me! Such a fun memory holder. Wow!! That looks fantastic. It almost looks like the numbers are etched/inset into the wood. Great job! you could sell these on etsy I bet! This is amazing!! you are so crafty!!! Okay, I'm calling this now....you need to open your own Etsy shop. Seriously, you're a PRO at DIY stuff! 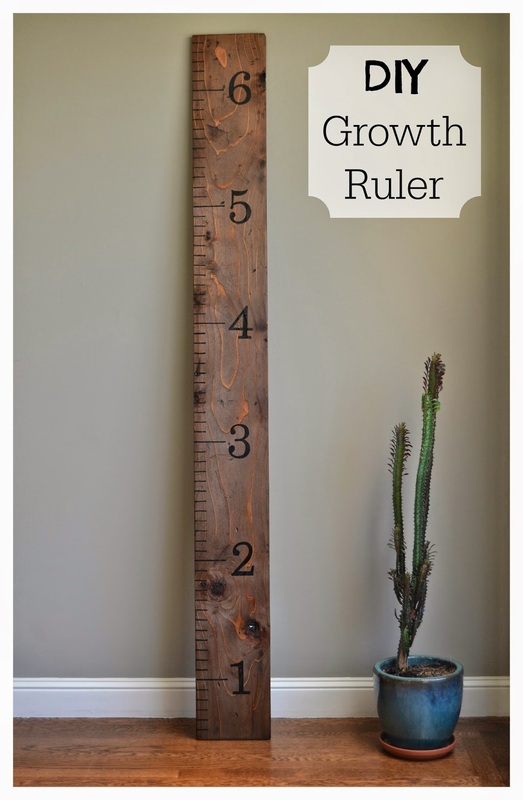 This growth ruler is so cute and such a great idea! What do you write on it with? A special marker or just a pen?